Still, it's worth reflecting on Texas' performance. Energy has something to do with it, of course. So, too, does Texas' relatively stringent mortgage rules, which helped to prevent the wave of bad loans that struck economies in bubble states (like California and Florida) and non-bubble states (like Georgia) alike. I think it's worth emphasising Texas' extraordinary population growth, and the way in which that growth kept the state's economy in a positive output growth equilibrium. Some might complain that not every state can duplicate Texas' success in this fashion; not everyone can prosper by attracting migrants from other parts of the country. That's true. But in a world in which millions of skilled foreigners would love to become American residents, every state can be a little Texas. The Brookings report noted the "very high concentration of high-skilled immigrants in older industrial metro areas in the Midwest and Northeast such as Albany [N.Y.], Buffalo, Cleveland, Pittsburgh, St. Louis and Syracuse [N.Y.]." The ratio of highly skilled immigrants for Detroit and Milwaukee, other benchmark regions, are equally strong. As far as economic development is concerned, Pittsburgh is a new demographic paradigm. As the Financial Times argues, the baby boom and the equities boom are joined at the hip. Mexican fertility is projected to drop below that of the United States, which recently hit an historic low. Pittsburgh is ahead of the curve, not behind it. Microsoft general counsel Brad Smith delivered a pep talk followed by an alarm bell during a presentation this morning to Seattle-area technology leaders — saying that the region is second only to Silicon Valley in terms of its technology prowess, but risks following in the path of Detroit and the auto industry if it doesn’t shore up its educational system. Smith realizes that Seattle needs to get better at talent production, something Pittsburgh excels at doing. Pittsburgh's overall population growth may be small, but the labor force numbers are surging and employees are increasingly college educated. Pittsburgh may not be getting bigger. But it is getting smarter and younger. That's the secret sauce for job growth, ironic demography. Several global metro economies experienced little to no ill effects from the worldwide downturn. Forty-seven (47) of the 59 developing Asia-Pacific metro areas achieved new peaks of GDP per capita and employment in 2012. Thirty (30) were Chinese and Indian metro areas that suffered no recession at all. Other developing Asia-Pacific metro areas, such as Jakarta, recovered strongly from small declines in previous years (see sidebar). In contrast, all metro areas in developed Asia-Pacific, North America, and Western Europe experienced recessionary losses on at least one of the indicators. Few, however, have recovered fully from those losses. Metro areas in developed Asia-Pacific achieved the highest recovery rates among the three regions, with about half returning to GDP per capita and employment levels higher than their peaks since 2007. Only five North American metro areas— Dallas, Edmonton, Knoxville, Pittsburgh, and Vancouver—fully recovered on both fronts. Emphasis added. 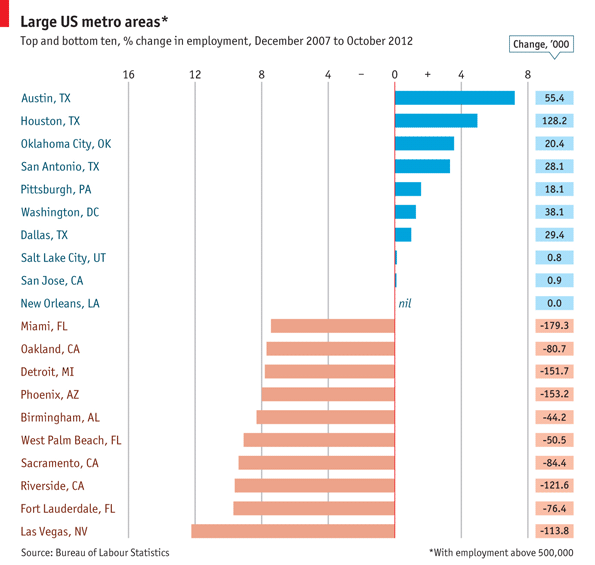 In terms of GDP per capita and employment levels, five North American metros have recovered. Only three (Dallas, Knoxville, and Pittsburgh) of the seventy-six US metros assessed (the report covers the top-300 metros worldwide) are "fully recovered on both fronts." Pittsburgh is in rarefied company. It is exceptional, even more so among the Rust Belt cohort. The metro economy has reached escape velocity. The economies of Dallas, Knoxville and Pittsburg rely heavily on large local service sectors in education, health care and government, as well as on financial and businesses services like banking and insurance. This can equally be said of plenty of other U.S. cites on this list. But each of these metros have growing local clients for all of those services, in the form of energy companies (Dallas), shale and natural gas extraction (Pittsburgh) and construction (Knoxville). That's a direct cut and paste. I didn't drop Pittsburgh's "h". A telling oversight when you consider the uncritically recycled narrative of the government sector fueling the metro economy. The same should be said about the shale gas rush. Good for Pittsburgh? Yes. The biggest plus is the publicity. It's a manufacturing renaissance! The myth-making has gotten out of hand. Boosters of drilling are using hyperbole to influence policy. Ultimately, the link between "Pittsburgh" and "Marcellus Shale" is good for business. Geographic stereotypes drive migration and impact firm relocation decisions. Pittsburgh is becoming the urban face of America's new energy era. What's changed? Shale gas. A new mesofact is born. Migration data for the most recent one-year period available, July 2010 to July 2011, show the Great Recession has shaken the rankings up quite a bit within the circle of fast-growth regions. The biggest winner has been Texas. The Lone Star state boasts four of the 10 metro areas with the largest net migration gains for the past two years. Dallas ranks first, followed by Austin in third place, Houston in fifth and San Antonio in eighth. In contrast, some of the growth leaders over the 2000-09 period, notably Las Vegas, and to a lesser extent Phoenix, have tumbled considerably in the rankings. The lesson here: a strong economy has to be based on something more than gaming, tourism and home construction. Energy, technology, manufacturing and trade are far preferable as an economic base. Also posting strong net migration gains for 2010-11 were Miami (second place), Washington, D.C. (sixth), and Seattle (ninth). In each of these areas, economic conditions appear to have improved. The once disastrous condo glut in the Miami area, which includes Dade, Broward and Palm Beach counties, has begun to clear up as foreign buyers pour into the region. Taxpayer-funded Washington is surging with new jobs and the highest incomes in the land. Seattle continues a long-term evolution toward the healthiest of the blue-state private economies. San Francisco, a consistent big loser for the last decade, jumped to 19th, presumably as a result of the current dot.com bubble. Another huge turnaround can be seen in New Orleans, which ranked a dismal 43rd for 2000-09 as residents fled not only Katrina but a stagnant, low-wage, corruption-plagued economy. But in our 2010-11 ranking, the Crescent City surged to a respectable 16th, one of the biggest migration turnarounds in the country. How about the biggest losers? From 2000-09, the metropolitan areas that suffered the biggest net domestic migration losses resemble something of an urbanist dream team: New York, which saw a net outflow of a whopping 1.9 million citizens, followed by the Los Angeles metro area (-1,337,522), Chicago, Detroit, and, despite recent improvements, San Francisco-Oakland. The raw numbers make it clear that California has lost its appeal for migrants from other parts of the U.S., and has become an exporter of people and talent (and income). And despite the cheap money Bernanke-Geithner policies of the past few years that have benefited giant banks centered in the bluest big cities, people continue to leave these areas. The 2010-11 numbers show the deck chairs on the migratory titanic have stayed remarkably similar, with New York still ranking first among the 51 biggest metro areas for net migration losses, followed by Chicago, Los Angeles, Detroit and Philadelphia. In most of these cases only immigration from abroad, and children of immigrants, have prevented a wholesale demographic decline. Emphasis added. Cities, such as Austin, continue to chug along as talent magnets. Las Vegas and Phoenix head up the pack of new losers. Speaking of Phoenix, Pittsburgh is now sandwiched between that metro and Jacksonville, Florida at 21st place for net migration (+3,740). For "net flow", I don't see a Rust Belt city faring better. In fact, few other industrial legacy metros sport positive numbers. (Notably Columbus, Indianapolis, and Louisville) If you look at the chart for "2010-2011 Net Domestic Migration for the Nation's 51 Largest Regions", you can also assess rate per 1,000 residents. Pittsburgh's ranking barely changes (20th). Last place (51st) is Cleveland with -6.04. That's a tremendous amount of migration pressure within Cleveburgh. Pittsburgh MSA labor force +26K year over year through October. Works out to +2.1% or more than double US labor force growth (+1%) over the same period. Also, check out the associated chart to better appreciate the slope of events. To my eye, the net migration estimate falls short of the mark. One shouldn't expect much (if any) in the way of natural increase in the workforce. Yes, some people who left the labor market are opting back in. I expect the net inmigration rate to pick up considerably for 2011-2012 when those numbers are available. All of the above lend credibility to the rosy anecdotes about the turnaround in Pittsburgh. Typically, the metro is sluggish out of the recession. Today, it leads the way and is accelerating through the recovery. Emerging from each downturn is an unexpected boom town. I saw it happen in Seattle and Minneapolis in the early 1990s. I see the same thing taking hold of Pittsburgh. "I had seen all these talented people dropping out of the profession around me and had the idea to go back and find out what all these women were doing. "These women feel they have been forgotten and their skills don't matter anymore." She added: "We have built a business around a skillset that has not been tapped into. We have fantastic lawyers of City caliber who can deliver results. "We are using people that have disappeared from the market. I'm keen to challenge the idea that professional women with children should be given work out of sympathy rather than be seen as a fantastic business proposition." I live in Northern Virginia, juggling stay-at-home dad duties and a blossoming career as a talent geographer. My peer group is made up of mostly college-educated mothers with a variety of occupational arrangements ranging from full time homemaker to full time jobs with substantial travel. I have more intellectually stimulating conversations at the playground than I did while in graduate school. Sitting on a park bench is an immense reserve of world class skills. Regions are focused on talent attraction and retention, instead of talent development. People develop, not places. What can your town do to get these women back in the game? Wasting brains is a much bigger issue than brain drain or brain gain. As The Economist notes, diaspora networks have three great potential strengths. They can allow information – anything from news of new products to investment opportunities – to cross borders. They can encourage trust – people from shared backgrounds are often more likely to believe each other. And they can create connections between people around the world. The potential of migrants and diasporas to contribute to development is increasingly recognised, including in recent research done here at the OECD. This research, which focuses in part on developing a better picture of migrant communities, offers some fascinating insights. One of the most striking is the level of education among migrants. Among immigrants living in OECD countries, around a million hold doctorates. Africa alone has about 2.5 million high-skilled emigrants living in OECD countries. Some of these people will eventually decide to return home, although many others won’t. But regardless of their long-term plans, most migrants like to maintain links with home and, where possible, to contribute to their progress. Finding ways to make that happen can be challenging. Diasporas are, by their nature, widely dispersed and often invisible. That’s one reason why the Internet, and especially social media, has such potential to bring them together. One French study has already identified 8000 websites linked to just 30 of the world’s diaspora groups. As interest in harnessing the power of migrants and diasporas grows, that number will surely rise. Emphasis added. Transactions and venture capital flow along lines of trust. Exporting talent builds a network that benefits local entrepreneurs. Businesses are moving to where the talent is produced. Leaving home is good for the economic development of an individual. Highlighting the reciprocity of migration aligns the interests of the individual with that of the community. People develop, not places. Tackling brain drain as a problem puts the place before its people. The UN Conference on Trade and Development (Unctad) is hurting the constituency it purports to help. Its attempts to make the world a better place ironically make things worse. Migration is an entrepreneurial act. People tend to be risk averse. Most moves cover only a short distance. You go where you know. That's bad news for regions with reputations as depressed and struggling. Why would anyone move to Ann Arbor? It is located in Michigan. Enough said. Yet what may have been the most difficult redevelopment was changing the minds of locals and others who first pooh-poohed the idea. “I heard far too many times that ‘This is Poland, your idea is impossible,’ ” says Christophe Mankowski, a voluble and bustling entrepreneur who creates new ice cream flavors as a hobby. The Mankowski siblings – Christophe, brother Nicolas, and sister Helena – were born and educated in France. But their engineer father came from Krakow to Paris in the early 1970s and later moved to Moscow to make a fortune in information systems. Now the Mankowskis, in their 30s, have returned to their Polish roots along the Slovak border – winning back some of the family land nationalized under communist rule. They’ve reclaimed and rebuilt the dream of their great-grandfather, Adam Stadnicki, a count who fell in love with the area in 1909 and developed it. A hundred years later, the count’s offspring still identify Poland as their native realm. Migrants, boomeranger or newcomer, don't realize what cannot be done. They jump right in and run through brick walls. Often, that is just what the doctor ordered for a down and out Rust Belt city. “Ireland has a history of constant bloodletting with people leaving the country, but this time it’s different. It’s the young and educated that are leaving. Most have university degrees or some kind of higher qualification,” says Looney. While people are leaving, many are doing so in order to grow their businesses, boost exports and find new markets, not to abandon Ireland altogether. The London Irish Centre found that 90% of new migrants were between the ages of 18 and 35 and - whilst drawn to the UK out of hardship - had come to “progress” their careers of their educational levels. Global talent migration patterns are divergent. The best educated are the most geographically mobile. They can country jump or city hop, circling back to base whenever it suits them. As for the less educated, they are typically stuck and left behind. The people who most need to emigrate either cannot or will not leave. The opportunity is caught up in the eddy of brain circulation. Like many expats who've returned, Watterson appreciates his hometown's familiar surroundings and how affordable it all is -- his Lakewood mortgage is less than the rent on his fifth-floor walk-up in Brooklyn. The key to luring more people, he says, is nurturing the city's authenticity and making sure the world hears about that, not about a fire or a fumble. "You can be based here and do globally significant work," Watterson said. "And if enough people are doing cool, innovative stuff, and if we are who we are and we embrace it, we'll be fine." Emphasis added. The big fish in a small pond story is a common theme. That's the lure home. Come do here what you cannot in Big City. The return migrants are changing the psychology of Cleveland. Pittsburgh, indeed, has a gap when you look at middle agers. So many of them left when the steel industry collapsed, and the city today is very old and fairly young. Ciccone, for one, spent time in Chicago and in New York before returning home to Pittsburgh and attending grad school at Carnegie Mellon. A caption on the wall calls it “a testament to his ability to intertwine art with ethnography” — not a bad caption, actually, for the ambitions of the Ace itself, which since opening its doors in Portland in 1999 has expanded to New York, Seattle, Palm Springs and Los Angeles. Make that Portland, Seattle, New York, Palm Springs, Los Angeles and… Pittsburgh. The problem is that current data cannot paint a full picture of why more people choose to move from Travis to adjoining counties. The available numbers don’t conclusively show whether those outgoing residents were pushed out by rising costs or opted to move out in search of more space or the myriad other potential factors. ... But that’s not to suggest the higher cost of living couldn’t have an impact on the region’s economy over the longer term. Over time, the outward flow of residents could add to Central Texas sprawl, traffic congestion and other infrastructure issues. And in theory, it could start to limit one of Austin’s most-popular recruiting advantages — its lower cost of living. There is a strong correlation between high cost of living and outmigration. But don't be too quick to draw policy conclusions from this observation. Teasing out causation is hard to do given the data lenses we employ. Outdated paradigms (mesofacts) still drive relocation decisions. We go where we know. The suburbs are a traditional aspirational geography. For now, mesofacts work in Austin's favor. With only Houston trending better, the city is accelerating out of the recession. The Texas Triangle (DASH) is the place to be. Whatever is pushing out the people, they are likely to land in the Lone Star state. High rents in the urban core be damned. The ferment of brain gain among European youth and IT wonks and mavens may be in the air. Yet – like visiting any school classroom to “see” education – it is often difficult to instantly quantify something as amorphous as “brain gain” taking place. Indeed, gauging the brain gain thanks to return migration can be tricky. The reshuffling of talent resulting from the financial crisis is only a few years old. The local impacts are just beginning to surface. For Krakow and San Antonio, the best is yet to come. In the cases of San Antonio and Cleveland (a previous return migration study I did last year), making those who did move back more visible and connected are the main problems. The brain gain tends to be isolated, its effects diluted. The inmigration is squandered. Venture capitalists cannot "see a talent pool of emerging firms with good ideas". In terms of demographic analysis, we are stuck in the era of manufacturing. We cultivate a local workforce for local jobs. We worry about the lack of population growth. A shrinking city means brain drain. That's inaccurate. Pittsburgh has lost people but gained college graduates. The workforce is growing, setting records monthly. The talent dividend metrics are rosy. So we've started obsessing educational attainment rates, a step in the right direction. San Antonio's numbers are surging in the right direction. But the overall percentage of adults with a college degree are still relatively low. The return migration remains hidden. New times demand new numbers. Stay tuned. On Thursday, Nov. 15 Texas CEO Magazine hosted a panel discussion on The San Antonio Brain Gain – Bringing the Talent You Need or Taking the Talent You Want? San Antonio ranks sixth in the nation for in-migration of residents with a bachelor’s degree or higher. The 80/20 Foundation in conjunction with SA2020 funded new research on these new residents, including why San Antonio is succeeding in attracting them, what verticals they are working in and what local talent demands they have. Rackspace Chairman and Founder Graham Weston and economic geographer Jim Russell will discuss the business sector's bringing - and needing - more talent and what the long-term implications could be for San Antonio. The event took place from 7:30 a.m. to 9 a.m. at the Omni Collonade, 9821 Colonnade Blvd NOWCastSA webcast the event for anyone to watch right here on this page for free, live or later, with their computer or mobile device. The election also confirmed a historic development a decade in the making: the undoing of the "Solid South" that Republican presidential candidates had come to count on. While the Deep South and Greater Appalachia remain solidly in their camp, the Tidewater country has become a reliable member of the "blue" coalition. For students of history and political consultants alike, this is an epic development. The Tidewater -- which encompasses the Chesapeake Low Country, the lower two counties of Delaware, and much of eastern North Carolina -- was the most powerful regional culture in the 17th and 18th centuries. Built by the younger sons of southern English gentry, it was meant to reproduce the semifeudal manorial society of the countryside they'd left behind, where economic, political and social affairs were run by and for landed aristocrats. It has long been fundamentally conservative, a culture in which a great value is placed on respect for authority and tradition, and very little on equality or public participation in politics. But for the past two centuries, it has been in slow decline, blocked from westward expansion by its boisterous Appalachian neighbors and, more recently, eaten away from within by the ever-expanding federal halos around the District of Columbia and the federal military bases at Norfolk, Va. Literally millions of people across the region have moved here and live their cultural and economic lives without reference to the cultural and economic landscape of Tidewater. In electoral terms, the region has crossed the tipping point. For two elections running, Tidewater counties from southern Delaware to east-central North Carolina have voted decisively for Obama. In 2008, his margin of victory in Tidewater was so great he was able to capture the Electoral College votes of both North Carolina and Virginia, despite overwhelming opposition across those states' Appalachian sections. This year, the pattern was repeated. He narrowly lost North Carolina (which has a larger Appalachian section) and won Virginia by three points. Nor was the pattern confined to the presidential race. In Virginia's U.S. Senate race, Democrat Tom Kaine owes his victory to strong support in the Tidewater, which allowed him to overcome Republican George Allen's 2- and 3-to-1 margins in most of the state's Appalachian counties. The defection of Tidewater, combined with the growing electoral power of Spanish-speaking El Norte, will likely continue to give Democrats a critical edge in presidential and U.S. Senate contests in the coming years. Both parties ignore the implications of this underlying regional geography at their peril. Emphasis added. The article comes with a map of the eleven nations and will aid in making sense of the above analysis.Rather than revisit the demographic destiny of the "GOP is Dying" post, I highlight the talent churn of the Tidewater nation and how migration has untethered that region from its historical geography. It is an earth shattering transformation. Tidewater nation, particularly Greater DC, is becoming a place onto itself. It has emerged as the number one destination for talent. Woodward argues that inmigrants conform to the historical geography forged long ago. The Tidewater is an exception to this rule. Inmigrants are driving the politics. That's not true in Chicago, Los Angeles, or even urban alpha dog New York. There is DC and then there is the rest of the United States. Out of the collapse rises the Pittsburgh Technology Council and a new economy. If you want to pull a Pittsburgh, watch the video (below). World views are important. They impact talent migration. World views are also subjective. If you can convince a large number of people to adopt your way of seeing things, then you will influence what happens on the ground. Geographic myths inform reality. The continent is an important part of Vale’s future, enthuses Ricardo Saad, the firm’s Africa boss. He is not alone in his excitement about Brazil’s prospects. Relations with Africa flourished during the presidency of Luiz Inácio Lula da Silva. He travelled there a dozen times and African leaders flocked to Brazil. His zeal was in part ideological: he devoted much of his diplomacy to “south-south” relations—at the cost, critics say, of neglecting more powerful (and richer) trade partners, such as the United States. Lula stressed his country’s “historic debt” to Africa, a reference to the 3.5m Africans shipped to Brazil as slaves. Outside Nigeria, Brazil has the world’s biggest black population. Dilma Rousseff, Brazil’s current president, is continuing those policies—though with more emphasis on how the relationship benefits Brazil. There are many ways that it can. Africa needs infrastructure and Brazil has lots of construction firms. Africa sits on oil and minerals in abundance; Brazil has the firms to get them out. Its agribusiness giants are also eyeing up Africa. If the continent’s economy continues to grow as it has in recent years, it will produce millions of customers much like Brazil’s new middle class. Brazilian businesses seem keen. In 2001 Brazil invested $69 billion in Africa. By 2009, the latest figures available, that had swelled to $214 billion. At first Brazilian firms focused their efforts on Lusophone Africa, Angola and Mozambique in particular, capitalising on linguistic and cultural affinity to gain a foothold. Now they are spreading across the continent. Emphasis added. That piece of demographic trivia surprised me. I immediately thought of "The Black Atlantic". I am surprised because of my own world view. Remembering Gilroy, The Economist story makes sense. It isn't a "new" Atlantic alliance. The connection has been around for centuries, lost in the telling of other histories. More than half of the start ups founded in Silicon valley since 2005 were begun by immigrants to America, with as many as 1 in 3 started by an Indian, according to research from the Kauffman Foundation. But now a small yet significant group of Americans are leaving their homeland for India. What makes this trend different from the usual flow of expat labour is that these people aren't on the usual fixed-term company transfer, but have moved east to become entrepreneurs, doing things on their own in an often tricky business climate. This is true brain circulation, not garden variety return migration. The flow from the United States to India is ironic. Opportunity is found in emerging markets. The Innovation Economy is rapidly converging. The dominant world view, such as Richard Florida's "The Rise of the Creative Class", is woefully outdated. Talent is seeking economic development, not cool urban amenities. District by district, Algonkian, Ashburn, Broad Run, Dulles, Leesburg and Sterling came in with more votes for Barack Obama, while western Loudoun districts Blue Ridge and Catoctin favored Mitt Romney. For the Senate race, the results were similar although Tim Kaine’s opponent George Allen won the Ashburn district by 10 votes. The success of Kaine and Obama in Loudoun may surprise some political onlookers, who noted that in 2011, voters almost unanimously selected Republican representatives, ousting several Democrat and Independent incumbents. The switch between a predominantly Republican outcome to a strongly Democratic one only adds to Loudoun’s placement as a swing county in Virginia. Like Virginia, Florida is slipping away. Some clever gerrymandering should buy the party some time to figure out what to do. The GOP is, literally in some counties, dying. Last month Kansas City unveiled plans to create a new attraction. The National Museum of Suburbia will allow visitors to wander through a re-created ranch-style home, peep through a white picket fence and spy on fake neighbours played by actors. There will also be a bowling alley for visitors to play on, along with exhibits of suburban and middle-class life. The timing seems apt, for in the United States today there is gnawing uncertainty and anxiety about what future awaits the country’s middle class. Emphasis added. Nothing says yesterday like a museum. To the contrary, Joel Kotkin contends suburbia is in the midst of a revival. The American dream is shaking off the foreclosure crisis. The burbs are growing, not shrinking. The urban core boom is more hype than reality. Wishful thinking won't bury the dominant residential geography. As an aspirational geography, go ahead an stick a fork in suburbia. Feel free to regale me with your population numbers. I'm not buying it. For people who have lived the dream, life is elsewhere. Review the paragraph in bold, "For many, suburbia equates to the American dream, a hopeful vision with roots dating to the Great Depression." This dream existed before the numbers supported the notion. Northern industrial cities had yet to peak in population. Sprawl was already in motion. Suburbia was the place to be before it was the place to be. By some measures, suburbia may continue to thrive for decades to come. That's doesn't make it a frontier, where we are headed. Life in the suburbs used to be a goal, something you worked for. Cosmopolites who give up on Big City when starting a family are heading back to the familiar. You go where you know. Once upon a time, Huckleberry Finn was describing the drive for suburban living. Before then, there was the exodus from the Rural South to Urban North. Today, we live in the Age of Return Migration. Where we dream of going is not where we grew up. We've been there, suburbia, before. We must escape Aunt Sally. Despite these signs of renewal and reinvention, the suburbs are still not the easiest places to visit. In Pantin, for instance, a walk around town requires a good map, a spirit of adventure and careful planning to avoid wandering into an unsafe neighborhood. Unemployment in this once-industrial enclave is still high; more than 30 percent of Pantin’s 54,000 residents live in subsidized public housing. But there are signs of new life. French companies have opened offices and workshops in Pantin, lured by cheaper rents and easy access to Paris. Hermès makes upholstery and luxury luggage and handbags (including its Kelly and Birkin bags) at ateliers here. Bourjois, Gucci and Agnès b. also have operations here; Chanel is expanding its presence. A tramway connecting Pantin to Paris and other suburbs will open at the end of the year. The Canal de l’Ourcq, which divides the town, is beginning to attract retail businesses and restaurants. Summertime water shuttles, like mini-Bateaux Mouches, offer rides up and down the canal. The Italian restaurant Brunello, opened two years ago by a Sicilian chef on the canal, offers excellent and well-priced pasta dishes and quaffable Sicilian wine (but disappointing pizzas). Nearby is La Famille de Lily, a Senegalese-French bistro and grocery that prepares dishes like carrot flan and chicken in preserved lemons and spices. The Ropac gallery, located in an industrial no-man’s land on a grim highway, has no cafe or restaurant and few parking places. The only sitting area is the Clubhouse, a private living-room-like lounge with a fireplace, a conceptual D.J. station, vintage designer furniture and an espresso machine, accessible to collectors and special guests. A bookstore is planned, along with conferences, screenings and musical and dance performances. Fashion designers have asked to rent the space for their shows, but have been politely turned down. “We don’t want to give away our soul too easily,” Ropac said in an interview. My favorite place in town is La Dynamo jazz and blues center, which hosts the “Banlieues Bleues” concert series in a 200-seat auditorium. On one side of the center is a courtyard that’s bordered by an apartment building where the Surrealist writer André Breton once lived and abandoned horse stables decorated with red bricks and ceramic turquoise tiles. The doors to the stables have been sealed with cement blocks. But the courtyard is big enough for a cafe. Or better, a wine bar. Xavier Lemettre, the director of Banlieues Bleues, told me that secreted a way in one of the stables is a superb private collection of wine. Maybe that’s a metaphor for the potential hidden all around the suburbs of Paris. Emphasis added. What soul? To someone from the States, an industrial suburb is an oxymoron. Also, France does have manufacturing legacy cities. The Paris pattern of suburban blight is a glimpse of the future for many Sun Belt boom towns. Greenfields are the new brownfields. To date, the gentrification of the banlieues is the best of evidence I've found that the costs of being in the center of it all have become too much to bear. The only game in town is geographic arbitrage. The core is played out. Opportunity is in the burbs. Rust Belt Chic.